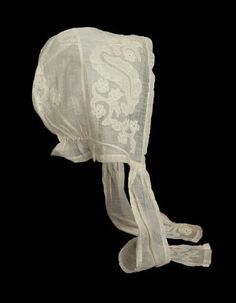 Since most of my Regency gowns were made for dance events or picnics, I’ve generally accessorized them with more formal items or bonnets. While these are appropriate for the occasion, I realize that I’ve been neglecting a standard piece of headwear for adult women– the cap. 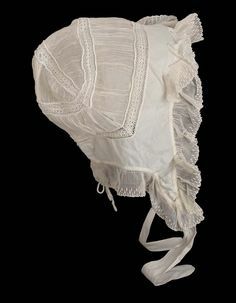 Women (at least once married or deemed spinsters) would wear them pretty much all the time, whether alone (indoors) or under bonnets for outings. They could be made of plain or embroidered muslin, or even lace. 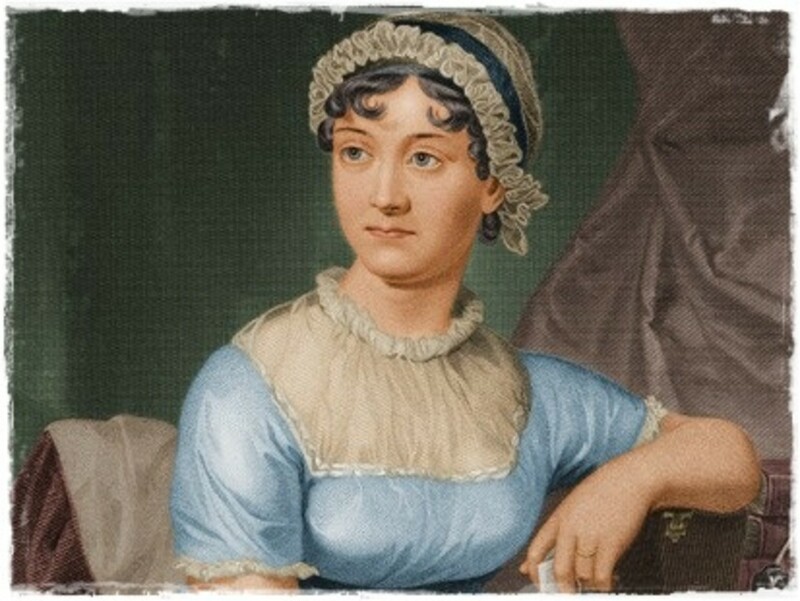 I thought that it might be nice to have one, either to cover up a not-so-historical hairstyle or just to add an extra touch of realism to an indoor outfit. The second cap pictured above is my favorite, with the embroidered net and delicate lace ruffles, so I started with that as my inspiration. 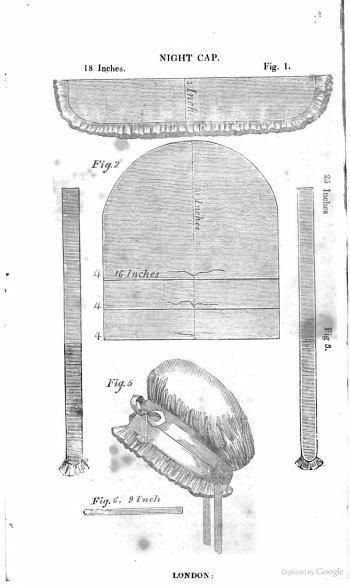 It looks as though there’s a ruffle, a band to attach the ruffle to, and a rounded piece that’s gathered along the edge to get the puffy top. I already had some leftover English net from my My Fair Lady gown, so I ordered two different kinds of embroidered net lace on Etsy– one that was more like a lace ribbon (straight on both sides) and one with a scalloped edge. The ribbon-lace is on a more open/transparent net than the scalloped lace, so before I used it I backed it with a strip of English net to make it look more similar to the other one. 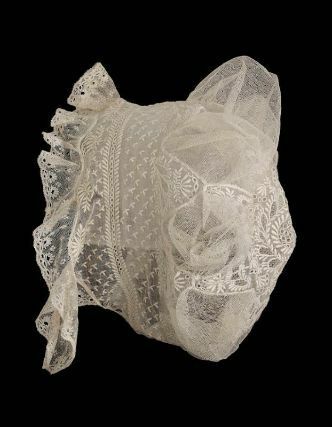 I will note that it was surprisingly difficult to find appropriate lace on Etsy– there were plenty of scalloped laces, but the ribbon-type lace was a tougher proposition, particularly since I wanted the motifs to be somewhat similar to the ones on the scalloped lace. This was one of the only options that I thought would work, as it was both wide enough to use as a band and had a nicely finished edges that would disguise stitching lines. I did a few quick mockups out of scrap fabric, just to make sure that the cap portion was the right shape– I will note that while I experimented with a more rounded shape, the “semi-circle on top of a straight section” shape ended up being the correct one after all. Mine was a semicircle 15″ across with a 4.5″ straight extension at the bottom. I used a 17.5″ length of the straight-edged lace for the cap band, tapering it down behind the ears (satin-stitching over the tapered edge so it looked more finished), and a piece of plain English net for the cap. I attached a ruffle of the scalloped lace to the band– it started off as a piece 2.5 times as long as the band and was gathered to fit. Since the band had finished edges I didn’t bother to do the whole “right sides together” thing with stitching– instead, I just stitched the finished edge of the band over the gathered edges of the other fabric, and trimmed down the gathered side where necessary. 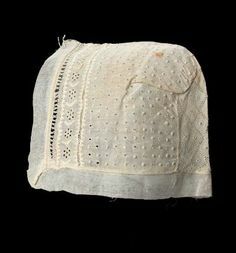 There’s a narrow drawstring channel across the straight bottom of the crown, with a drawstring made of ivory embroidery floss. I could’ve used ribbon (still might) but I was trying to make it as unobtrusive as possible. Admittedly, the back of the cap is rather plain– I did experiment with adding some extra pieces of lace to the back for decoration, but it looked clumsy so I stuck with simplicity. The net itself is just a bit droopy to puff properly over my hair, so I may experiment with starching the finished cap, but that can wait for another day. The whole project took me less than two hours and was completely machine-sewn, and much of that time was taken up with mockups of the crown. Not bad for an evening’s work! wow thats Marvelous!! am very impressed. Love it!!! It’s so delicate! I’ve also had rough luck searching net lace on Etsy but you had a wonderful find! That will definitely be a fun accessory for daytime events! I hope I get to see it this spring. The net has such a lightweight quality due to its sheerness. And it seems you did a great job finding trims that would coordinate. Looks great! It looks so soft and pretty! I love it! Great job! Backing the ribbon lace with netting appears to have worked beautifully.